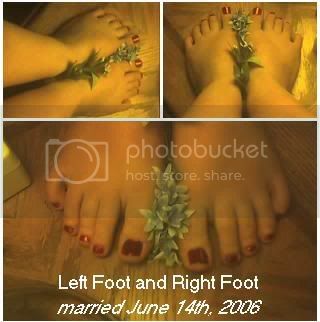 June's Trampy Toes Monthly Photo Contest! Okay, so LisaJaney's whole trampy toes thing had me rolling and I though it would be a great title for a monthly photo contest. Of what else but TOES! On the last day of every month, I'll choose a winner for the best toenail polish. If you have stellar toes just snap a shot. I'm looking for fun colors, outrageous designs, or just outstanding plain ol' toenails (if you can make 'em unique! ). Whatever you feel like, post it! The winner of the contest will be the proud wearer of the "Trampy Toes of the Month" usertitle (the names under your member name). Here are two pictures of toes to get everyone started (don't worry, we're not eligible!). Everyone else, post your pictures in a reply to this thread! Last edited by Stephanie : June 14th, 2006 at 08:29 PM. ...or just outstanding plain ol' toenails (if you can make 'em unique! ). Whatever you feel like, post it! What if you have ugly toes/toenails like me? But- I *do* have unique toenails; I'm missing 3 of them. Oooh! Great picture, Justgreen! Too bad Hollie's not here. She'd jump through the screen for that peep. KoalaKim, if you have outstandingly ugly toes, POST 'EM! Who knows! They might take the cake! Nastasska, I think that My Chihuahua Bites color may just do the trick... Either that or the other one (or was there just ONE nail polish and two lipsticks? I can't recall...) Those were wild. I LOVE that Aunti Drinks Chianti color, though. Maybe I ought to wait til I feel good about my toenails and submit it THEN, so I have the best shot at owning the "Trampy Toenails of the Month" name. You know I'd KILL for that title. That plus my avatar? Holy cow, I'd not be fit to LIVE WITH! I guess I'll enter since my toe is kind of a tramp. She is wearing OPI Changing of the Garnet. Now- to get the courage up to actually *take* a picture of them. I don't even wear sandals because I'm so embarassed by my MIA nails. 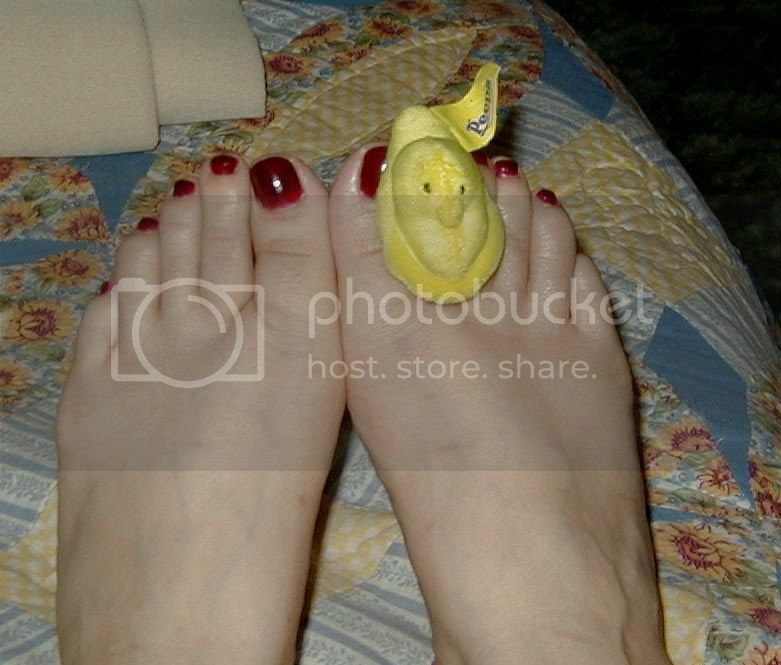 Justy- *love* the Toe Peep! Much better than Toe Jam! Can't wait to see more creative toes. Hey- where's Carolyn? This should be right up her alley. Oohhh Rain! Your toe is lovely today, I love her hair. And your peeping toes are fun too Justy. Mine are dancing They're in Love my Nails "Strawberry Sizzle" but it's kinda hard to see. My toes are tamed tramps.